Recently, when trying to install Corel VideoStudio Pro X4, I ran into a bit of a problem. The process seemed to start out alright, but a second or two after the installation window appeared, everything disappeared but the name of the software on the black window background. Basically, the window looked like the one shown in the image to the right (click for a larger view), but instead of a Remove button, there was only a grayed out Next button. At first, I thought the program may just need a little time to load the installation files, but after waiting about 30 minutes, I was pretty sure something was wrong. So, I started to do some digging around to see if anyone else had the same problem with this release or any prior version of VideoStudio Pro. After a good bit of searching, I finally found someone else with the same problem – and the fix wasn't that bad at all. Basically, this particular installation problem is related to a particular user account setting. 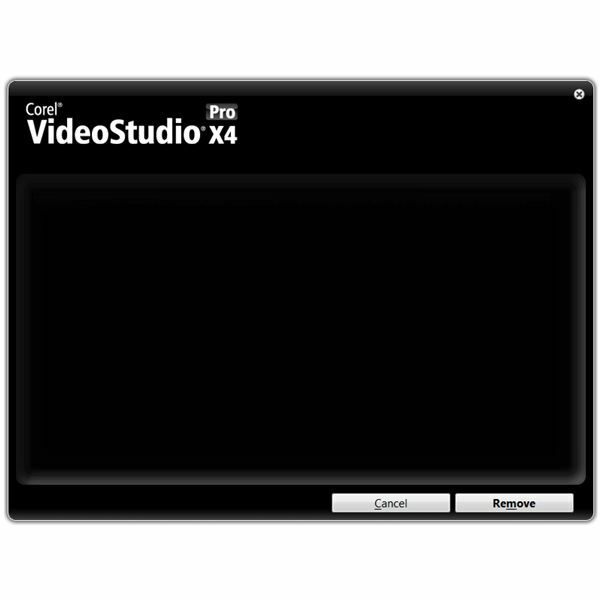 I first found a post in the Corel forums by a user having the same problem with VideoStudio Pro X3. After a lot more searching, I found that in addition to VSP X3 and X4, the same problem can crop up with PaintShop Photo Pro X3 as well. Eventually, I found a more detailed answer on the Corel website – but I have to say, it took a lot of searching. So, while the problem may not be that common, it seems worth the effort to repost the details for others who are having the same issue and can't find the answer. If you can't install Corel VSP because of this issue, there are a couple of ways to fix this problem. Both are summarized below, but you may want to refer to the Corel link provided in the References section at the end of this article for more details. Method 1: Since the problem is related to the settings for an individual user, probably the easiest thing to do is to create a new user with full administrative rights and install the program while logged into that account. This way, you don't have to worry about changing any of the settings on your primary account – which can be a little dangerous if you're not comfortable working with the Windows Registry Editor. After you install the software in this new account, you can log out of it and log back into your primary account. There's no problem with actually using the software in your primary account – just the issue with getting the program installed in the first place. Method 2: If you're familiar with the Windows Registry Editor, you can make a manual change to the Registry instead of creating a new user account solely for the purpose of installing VSP. If you choose this method, please be sure to back up your Registry first – just in case. 1. Open the Registry Editor (if you're using Windows 7, you can do this by clicking the Start button and typing regedit in the Search box, then hitting Enter). 4. Exit the Registry Editor. You should now be able to install VideoStudio Pro. I chose Method 2, and it was a quick and easy fix. After that, it only took a few minutes to install VideoStudio Pro X4, and I was up and running.